It’s hard to believe it, but Easter is just around the corner. For most people, that usually means eating stupendous quantities of chocolate, but I get waaaay more excited for all of the festive breads, and most especially the hot cross buns. Most bakeries carry traditional hot cross buns this time of year, but I much prefer to make my own so that I can play around with different flavour combinations. What can I say? 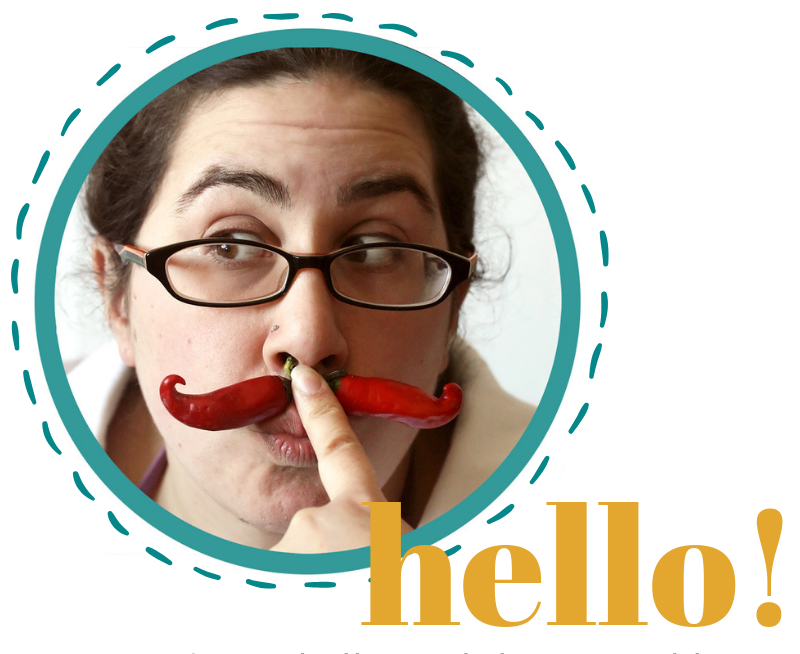 Making new twists on old favourite is kind of my shtick. Over the years, I’ve tried a few different variations on the classic hot cross bun, ranging from fairly straightforward cherry and lemon buns all the way to some totally off-the-beaten-path savoury bacon and green onion buns. However, I have to say that this year’s version might just be my favourite of all time. It started with a simple brioche dough, which I flavoured with almond, lemon zest and nutmeg. Then, I add in a generous sprinkling of dried blueberries and the remnants of a container of candied lemon peel that had been lurking in the back of the pantry. There’s just something about blueberry and lemon together that feels so perfectly spring, don’t you think? The blueberries are clearly the star of the show, with the almond and lemon flavours politely playing a supporting role, all wrapped up in a pillowy soft dough that’s got just the right amount of sweetness to hold everything together. 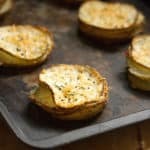 Once you’ve made your own, I promise you’ll never want to go back to those dry, tasteless hockey pucks they sell at the grocery store! 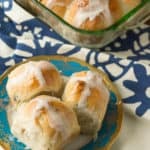 Hot cross buns are a traditional British treat that has been around since the Middle Ages, though nowadays you’ll find them pretty much anywhere the British Empire once ruled, including here in Canada. 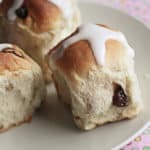 Like many of the other special holiday breads that are made throughout Europe to celebrate Easter, these buns were typically baked on Good Friday to mark the end of Lent. 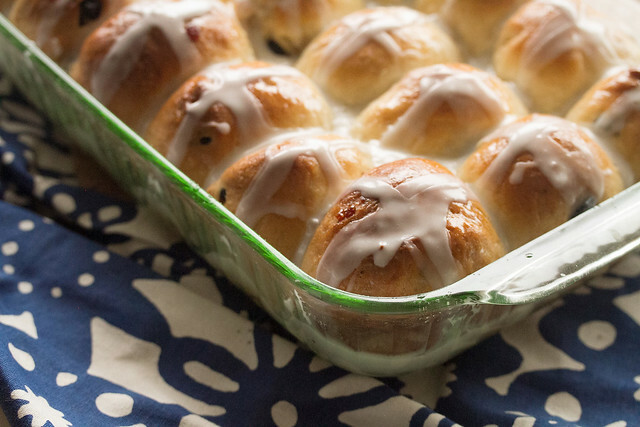 The traditional recipe for hot cross buns is flavoured with a combination of raisins, candied citrus peel, and a blend of spices (usually cinnamon and allspice, sometimes nutmeg, ginger and/or clove). However, almost any kind of dried fruit can be used if you’re not a fan of raisins or candied peel. 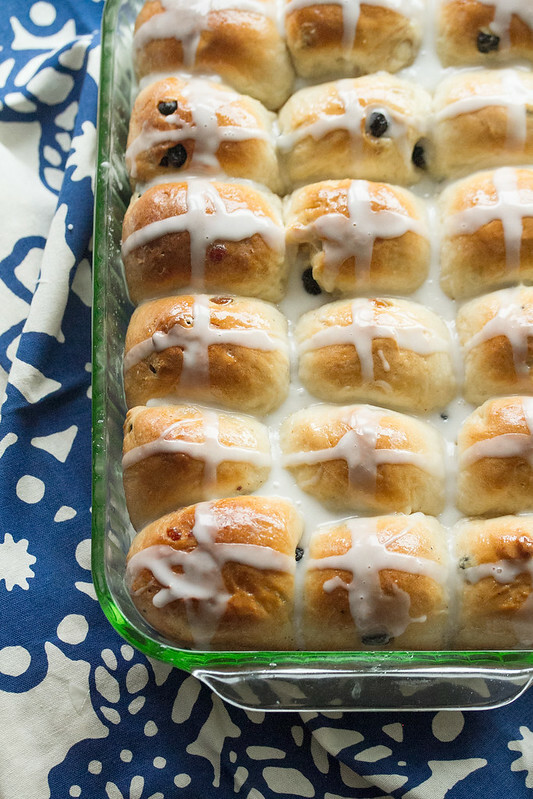 Today, you’ll find everything from apple-cinnamon to sticky toffee to chocolate chips baked up into hot cross buns. 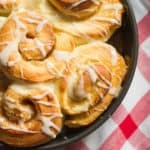 The symbolic cross pattern is usually made by piping a paste of flour and water onto the buns just before baking, though some recipes (this one included) opt for a simple icing cross instead to add sweetness to the finished buns. Apparently, there’s an old wives’ tale that a bun baked on Good Friday won’t go stale for a whole year. I have my doubts about that particularly superstition, but it’s not like I had much opportunity to put it to the test, since most of the buns disappeared before the day was done. Busy Morning Ahead of You? Try the Overnight Rise Method! Like most sweet buns, you can do most of the prep work the night before to make your life easier in the morning. Just prepare the dough as directed until you’ve shaped the buns and arranged them in the baking dish, then cover tightly with plastic wrap and place in the fridge to rise overnight. The next morning, pull the buns out to warm to room temperature while you preheat the oven, then proceed with the remaining steps in the recipe. It’s that easy! 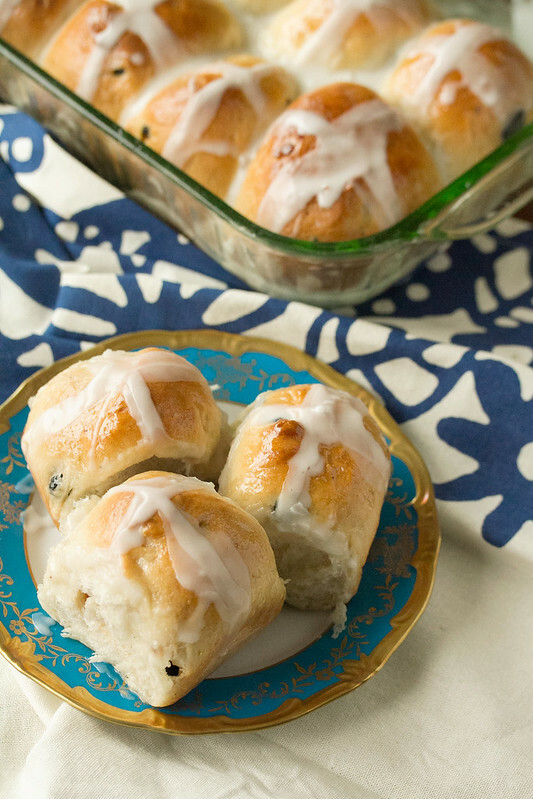 These new-school hot cross buns trade the traditional raisins and heavy spicing for a fresh spring-inspired combination of blueberry, almond and lemon. In the bowl of a stand mixer fitted with a dough hook, combine the warm milk, sugar and melted butter. Sprinkle with yeast, and let stand for 5 minutes to allow the yeast to proof. Add the egg, lemon zest and almond extract, and mix until well combined. With the mixer running on low speed, gradually add the flour, a half-cup at a time, until the mixture starts to come together. Add the blueberries, lemon peel, almond flour, salt, and nutmeg, and mix on low speed until the dough pulls away from the sides of the bowl and forms a soft, elastic ball. 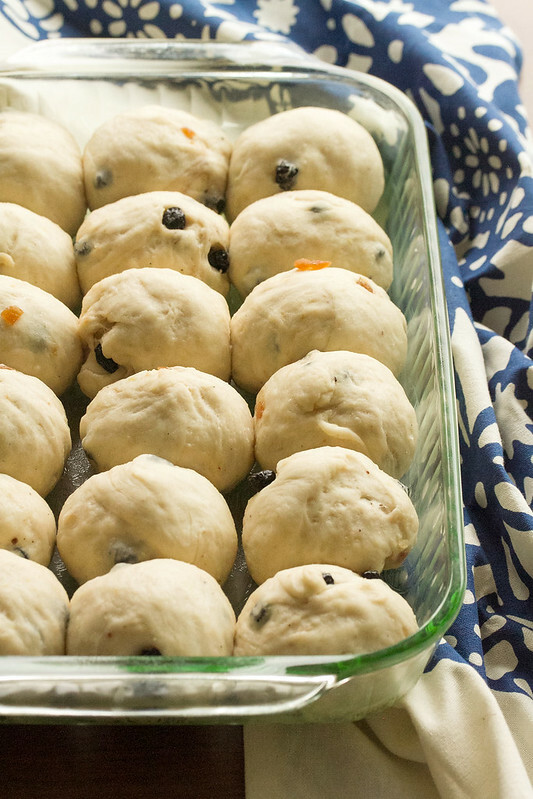 Transfer the dough to a lightly oiled mixing bowl, and cover loosely with a clean dishtowel. Set aside to rise in a warm, draft-free spot until doubled in size, about 60-90 minutes. Punch down the dough. Transfer to a lightly floured work surface, and divide into 20 pieces. Roll each piece into a ball, and arrange in a greased 9x-13″ pan. Cover the pan with a dishtowel or plastic wrap, and set aside to rise for 45 minutes. While the buns are rising, preheat the oven to 375ºF. Bake the buns for 30-35 minutes, or until tops are golden brown. Meanwhile, prepare the glaze by simmering the sugar and water in a small saucepan over medium-high heat until the sugar dissolves. 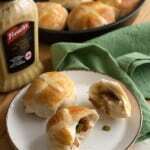 Brush the warm glaze onto the buns as soon as they come out of the oven, and set aside to cool completely. In a small bowl, whisk together the icing sugar, milk and almond extract until smooth. Transfer to a piping bag fitted with a plain tip, and pipe crosses onto the tops of the buns. Let the icing set up for at least an hour before serving. 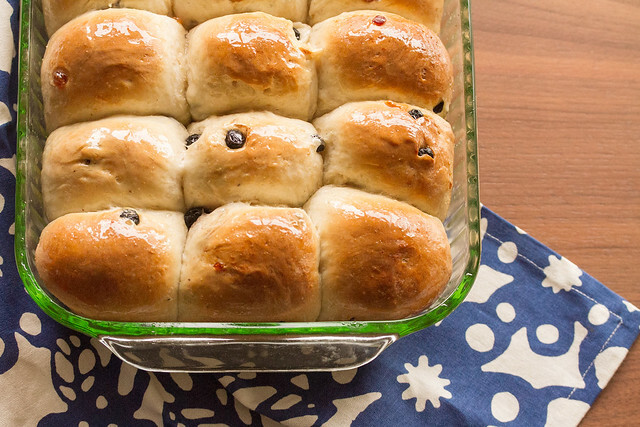 I have never made hot cross buns, and I can’t wait to try this recipe. I love the almond flour addition and the dried fruit. Plus, that overnight rise method is a great tip. Thank you! Lovely recipe, Isabelle – the combination of blueberries and lemon in a brioche dough must be wonderful! Thank you for this new twist on an Easter favourite. What kind of yeast? How many grams? Is it the Fleischman’s dry kind? 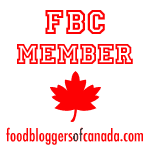 If we have FRESH yeast, how much would we use?